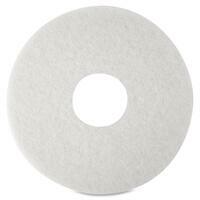 Niagara White Polishing Pads are designed for buffing very soft finishes or for polishing soft waxes on wood floors. It can also be used for light cleaning to help remove soil and scuffs marks with minimal dulling of finish. Use 12 pad with rotary or automatic equipment for spray cleaning or dry buffing with low speeds from 175 to 600 RPM.